The monkey is an intimate one, but that does not mean they want to spend a lot of time in the bedroom. Sexually the monkey woman and pig man in bed make good partners. But each will expect the other to give them what they want. The male pig will jump into going after their goals. They can definitely profit from the female monkey’s money smarts. The monkey is not too keen on their partner being so giving because they often feel they might be doing it at their’s expense. The pig will often show kindness to others, which is something that makes the monkey unhappy. Chinese astrology compatibility predicts that when the pig is dating the monkey, they want their loving gestures to be appreciated. If this is not done, then the Monkey Pig who could go on to be soulmates might breakup. These two Chinese zodiac signs need to try harder to make sure their efforts match up to each other. The pig is not very good at understanding the monkey’s nature. The monkey seems to think the pig is a little boring because of their honest nature. The monkey has quite a bit of charisma that other people will usually be attracted to. The pig is a simple one and finds the monkey too complex and sort of snobby. In a monkey pig marriage, these two will find that arguments happen from time to time. But because of their excellent understanding and friendship, everything will be resolved. 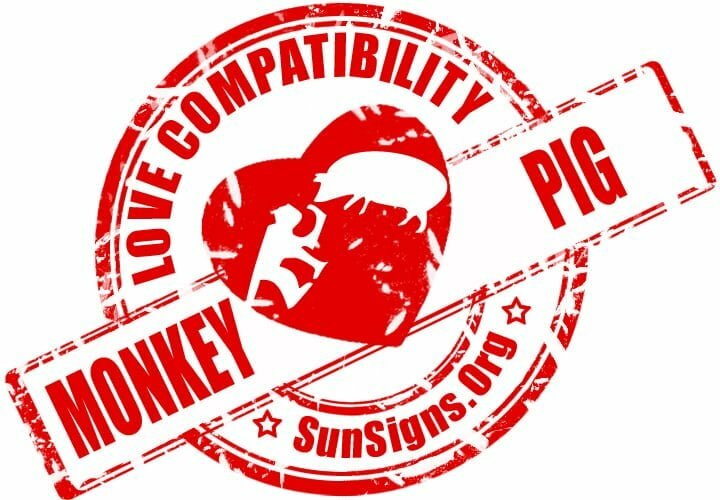 Monkey & Pig Chinese Horoscope Compatibility Rated 4 Hearts!